Most runners I meet seem to lose their appetite after a run, but I'm the total opposite. I could eat one mighty piece of steak after a lengthy run or gym session. So, I'm always trying out different foods that will help me avoid temptation, refuel after excercise or get through the afternoon. Mule Bar is my most recent find. It come in a huge range of weird and wacky flavours that make them completely different to other energy bars I love. They're also natural and are part of the made-in-UK crowd. As such, they are suitable for runners, cyclists, ramblers (the walking, not talking, kind) and anyone with an active lifestyle. You can buy them online at Wiggle, Evan's Cyclists or online at Mule Bar where you can even buy boxes of the bars. Mule Bar sell three types of product: energy bars, ReFuel protein bars and energy gels, all of which come in the weird and wacky flavours. They are the first company I've found to sell bars that come in seriously sweet, mildly sweet and savoury flavours. Before I go on, I have to say that I really don't like very sweet things. I'm more of a mildly sweet or savoury kind of girl. If you are the sort of person who can guzzle through ten palmiers then you will absolutely love Mule Bar's sweet flavoured range. The energy bars are suited for mid afternoon snacks. At work, I quite liked having a Mule Bar as a healthy pick-me up. I don't know what it is about City workplaces, but people love to bake cakes or bring in brownies and flapjacks all the time. When you're trying to eat better, this is so difficult. But you know what? With Mule Bar, you feel like you're getting that sweet fix, just without the 'bad stuff', and so saying no to the cakes is made easier. In terms of the energy bars I tried, I didn't like the Apple Strudel bar. This was incredibly sweet and sticky and I just felt like I was biting into sugar. I think the sweetness came from the apple juice and raisins, which perhaps wasn't a great combination for me as I really don;t like raisins. I absolutely loved Jimmy's Chocolate Orange bar. This was actually the first bar I tried. I was dubious about this because I really, really don't like orange flavoured chocolate, but like I said, I loved this bar. It was like a jaffa cake but so much tastier and healthier! It was also very soft and slightly gooey so I decided to slice up a few pieces and spread them over apple slices. Best spontaneous decision I've ever made; it tasted so, so good! Great for an afternoon snack with Earl Grey tea at work or even a post-run snack. The savoury flavoured energy bar was a total surprise for me. This is the Eastern Express spicy mix bar. Mule Bar market it as a curry-flavoured bar. I'll be honest here. When I read that, it put me off trying the bar. A curry-flavoured bar doesn't sound that nice in my opinion. After finally plucking up the courage to try it, I was happy to find that whilst it did have a savoury 'eastern' taste, it didn't taste like a curry in a bar. The garam masala in the bar gives it a kick in the back of your throat, and if you haven't tried that before, it might come as a surprise - a good surprise that is. The crunchiness from the pistachios gives it a nice touch. If I was an ultra runner, this might be a bar I would consider. 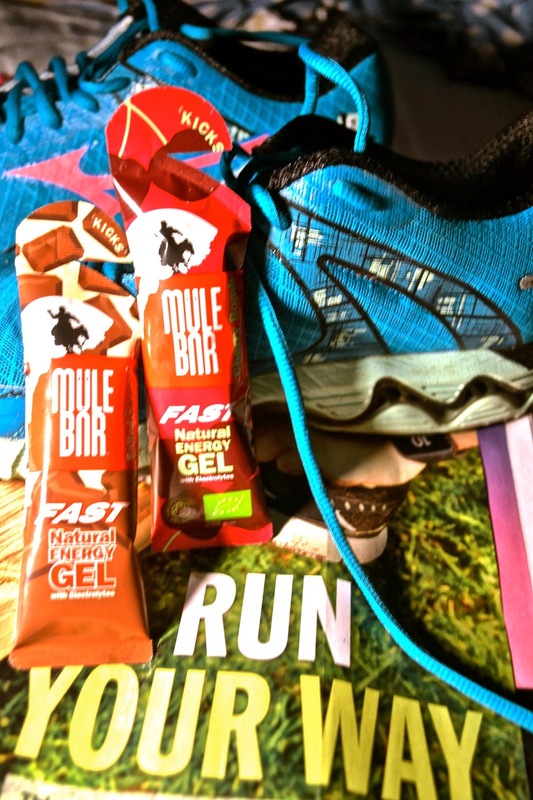 During my longer runs for my half-marathon training, I tried the Mule Bar energy gels. The Lemon Zinger tasted far too sweet for me and I had to wash it down with lots of water, but it definitely put a zing in my step. I found the same with the Cherry Bomb flavour - partly because I also don't like cherry. The Salted Caramel flavour worked better for me, and having tried a few other energy gels, I've chosen this one and the Mule Bar Cortado energy gel (you know I can't say no to coffee) as the ones I'll be taking with me during the half marathon. The ReFuel protein bars were a firm favourite of mine. They come in Chocolate Date and Chocolate Banana options. I tried these during my half marathon training (D-Day is 29 March at Hampton Court, don't forget to note it!) and devoured them with love after the runs. These are more of the mildly sweet side and look like chocolate bars, rather than a protein bar. They were ever so slightly sticky but perfectly gooey and with a glass of almond milk were lush. Have you tried Mule Bar before? Let me know what your favourite flavour is on twitter or drop a comment below. Disclaimer: Mule Bar kindly sent me the energy bars, ReFuel protein bars and energy gels to try. All opinions are 100% honest and my own.